Saint Gemma was a layperson whose life was marked throughout by divine favors and extraordinary graces, and also great trials and sufferings. Though she was a extraordinary mystic and stigmatic, bearing in her body the marks of the Lord Jesus, her spiritual life was quite hidden from the world. She was never the object of public curiosity or veneration. From outward appearances her life seemed ordinary, but her soul lived in the heights. She was especially chosen by God to be a soul victim, that is, she was especially called to sacrifice and suffer for the conversion of sinners. In other words, she was a victim of Divine Love. Hers was a life of sacrifice and suffering for the conversion of sinners and in reparation for sin. It was during these tender years that her mother fell a victim to tuberculosis. Her long lingering illness, endured with saintly resignation, was made more difficult by the thought that she must soon leave her children when they most needed her care. Gemma came to know that her mother was going to the heaven of which she had so often heard her speak, and her great wish was to go with her. Every day as she returned from school her first thought was to hurry to her mothers sickroom fearing that her mother might have taken flight in her absence. 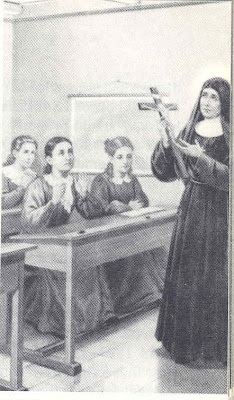 Meanwhile the day of her Confirmation came, May 26th, 1885, and with it the first of those heavenly communications which played such a large a part in her spiritual life. During the Mass of thanksgiving after the ceremony “all of a sudden,” she tells us, “ a voice in my heart said to me: “Will you give me your Mamma? It was her first great sacrifice and it cost her bitter grief and tears; but when her mother died a few months later it was Gemma who consoled the others. Gemma was only eight years old. “Why should we cry? Mamma is gone to heaven” she said. Shortly after her mother’s death, Gemma was sent to the school of the Sisters of St. Zita in Lucca. Under the guidance and direction of the good Sisters she acquired a greater taste for prayer, and a tender devotion to the Passion of Our Lord on which she began to meditate daily. Her love for the Mother of God was always deep and intense, the more so as she had lost her earthly mother. 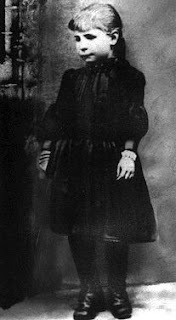 “If God has taken away my mother,” she would often say, “He has left me His own.” And her frequent prayer was: “Holy Virgin, make me a Saint.” During this time she often said the whole fifteen decades of the Rosary on her knees in the evening after her return from school and she also began to use penances and to rise in the night to pray. Gemma’s school life was brought to an end by a painful illness. An injury to her foot which she made light of resulted in a severe and painful infection and she was forced to remain bedridden for some months. An operation was necessary, but she refused an anaesthetic and with eyes fixed on the crucifix suffered the excruciating pain with little but a moan or two. The doctors were amazed and edified by her courage and endurance. Restored to health she now took her place in the home to do the duties that naturally fall to the eldest daughter in a motherless family. During this time she kept quite busy, for it was a large household. In the intervals she busied herself in making altar linen and vestments for the church or clothing for the poor. However her activities were not confined to the home. She would often gather the poor children of the neighborhood together for religious instruction. She frequently visited the sick in hospitals, bringing them little material comforts but especially “comforting them with thoughts of God.” Her charity to the poor and sick went almost to the point of extravagance. Every time she went out she would ask her father for money to give in charity, and if sometimes he refused she would coax permission to take bread or whatever she could lay her hands on at the moment. God was not long in answering her prayer for it was at this time that she was diagnosed with spinal tuberculosis (or possibly spinal meningitis). She had felt symptoms for awhile, but her pious repugnance to medical examination made her conceal it until she found herself bedridden. Her pitiful condition, and the patience and sweetness with which she suffered drew those who knew her to her bedside. One of these brought her the "Life of Venerable Gabriel Possenti", who was known for his sanctity and miracles though not yet canonized at that time. Gemma at first took little interest in the Life but having once invoked Brother Gabriel’s name in a distressing temptation with instant effect, she then read the book several times and thus developed a special devotion to him. Not long afterwards he appeared to her amidst her grave illness, speaking words of consolation and encouragement. Gemma's cure was complete and permanent. Her illness had lasted more than a year and had brought her to death's door, but afterwards her health was perfectly normal. Her first thought after her recovery was one she had long hoped for -that of entering a convent. Circumstances up to this point had made it impossible to realize, but now her way seemed clear. Several religious communities in Lucca would gladly have accepted her, and even encouraged her hopes. But ecclesiastical authority was slow to believe in the permanence of her sudden cure from such a dangerous disease and also her extraordinary mystical experiences were known to the local Bishop. So to her great sorrow Gemma found the convent doors regretfully but firmly barred against her. The vision filled Gemma with a new horror for sin and with an intense desire to suffer with Jesus and to become a victim for the salvation of souls. The desire was to be gratified in a way she little expected. One morning after Holy Communion she heard the voice of Jesus say to her, “Courage Gemma, I wait for you on Calvary where you are soon going." Apart from her confusion and distress at such a sinner being so favored, Gemma's only thought seems to have been like that which occurred to her after her First Communion when she felt a fire burning in her heart and also that it was a common experience with those whom Jesus had chosen for His own. She began to make timid inquiries among her friends during the day, but only succeeded in mystifying them without obtaining any information. At last, feeling that she must confide in someone, as the blood continued to flow, she went to her aunt and holding up her hands said with the simplicity of a child, “Aunt, see what Jesus has done to me.” The good woman was struck dumb with amazement, but as little understood the meaning of the strange phenomenon as Gemma herself. The phenomenon was repeated regularly every Thursday evening, beginning about 11:00pm and lasting until 3:00pm in the afternoon of Friday. Gemma seemed to pass through all the phases of the Passion and bore in her body all the marks of Christ's physical sufferings: not only the wounds in hands, feet, and side, but the punctures of the crown of thorns, the marks of the scourging, the wound on the shoulder caused by the weight of the Cross, all accompanied with the most excruciating pain. Throughout those hours she engaged in loving conversations and colloquies with Jesus in a low voice, often tenderly pleading for mercy for sinners and offering herself as a victim in expiation for their sins. She found a prudent and sympathetic adviser in one of the missioners, who communicated with Mgr. 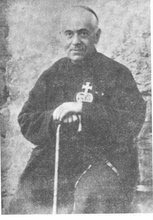 Volpi, her confessor, with the result that the Passionist Father Germanus was ultimately appointed her spiritual director. Mgr. Volpi was perplexed and doubtful about the authenticity of Gemma’s extraordinary mystical experiences. The mission Father and those whom he consulted were equally at a loss. Father Germanus, a priest of large experience and of a dry and scientific turn of mind, was frankly sceptical when first consulted by Mgr. Volpi, and he intitally declined to have anything to do with Gemma, and advised him to make his penitent follow the common spiritual path. It was only after considerable pressure that he was induced to visit her. After a searching and thorough investigation, however, he came to recognize in her an elect soul, “a true Gem of the Sacred Heart of Jesus,” and remained her spiritual director for the rest of her life. At this time Gemma’s father died, leaving the family destitute, and she was then obligated to live with one of her Aunts. Gemma was 19 years old at that time. “It is good to hide the secret of the King.”, and one of Gemma's chief anxieties was to keep secret of the great things God had done to her from the eyes of outsiders. It was soon evident that in her aunt’s house this was impossible. The younger members of the family were curious: not one was sympathetic: things began to be talked of outside, and much of what was said was not very kind. Gemma was frequently rapt in ecstasy even in the course of her daily occupations, and was thus at the mercy of those nearby who did not understand such extraordinary graces. She had to suffer much in consequence. At length, through the influence of the Passionist Fathers, she was received into the home of their benefactors the Giannini family; a well-known family in Lucca, first as an occasional guest, then finally as an adopted daughter. 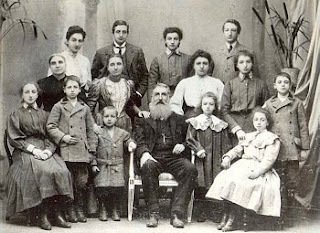 The household consisted of the father and mother with eleven children, and an aunt named Cecilia, who already knew and admired Gemma and was to become a adopted “mother” to her. She did not confine herself to intercession for sinners in general, but almost constantly “carried on her shoulders,” as she would say, some obstinate sinner for whom she was asked to pray. And endless conversions were wrought by her prayers, from the dying man that refused to receive the Last Sacraments, who was converted by her prayers as a child at school, to the notorious sinner of Lucca whose conversion was announced to her the day before she died. 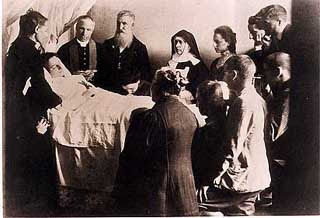 Her sufferings were not meaningless, nor merely a personal discipline: they were the instrument of a great apostolate for the sanctification of souls, and especially for the conversion of sinners, that drew all its inspiration and all its virtue from her continual union with Jesus Crucified. She had never lost her childhood’s desire of entering a convent. And from the time she first met the Passionists and heard of the Passionist Nuns, she felt that her place was with them. There was a convent of the Order at Corneto, Italy some two hundred miles from Lucca, and after asking advice she determined to go there for a course of spiritual exercises and ask admission. She met with a decided refusal, worded in no very genial terms, from a Reverend Mother who had heard about Gema’s illness and cure, and also the extraordinary graces that surrounded her life, and was therefore convinced that such a mystic (or possible hysteric?) would not be suitable for their contemplative Community. It was a bitter disappointment to Gemma, but she bore it bravely and patiently. Subsequent efforts were made in her behalf by her confessor Mgr. Volpi and her spiritual director Father Germanus, but without any effect. Gemma began as far as she could to lead the life of a Passionist Nun outside the cloister. She had already made a vow of chastity during her serious illness, and to this she now added with her Confessor’s approval the vows of poverty and obedience. She wore the Sign of the Passion on her heart underneath her clothing, and recited the Divine Office daily like the Passionist Nuns in choir. And she never lost the hope till near the end of her life of joining them, if not at Corneto, then elsewhere. Today the Passionist convent in Lucca continues to flourish. Gemma’s body reposes near the altar in the little chapel and the nuns venerate her as their foundress and the patroness of their work. “The Passionist Nuns would not accept me,” she had said, “but for all that I wish to be one of them, and I shall be with them when I am dead.” So was Gemma’s wish fulfilled at last. 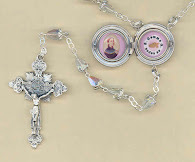 “If for reasons independent of her will,” writes a companion of hers now a Carmelite nun, “Gemma never wore the Passionist habit, she was none the less a true Passionist. She was a Passionist in soul, and she had the spirit of the Passionists. The Order has made her its own. 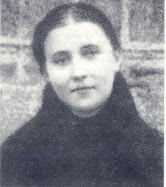 Her convent has been established for years and continues to flourish exceedingly.” The same thought was expressed by Benedict XV in the decree introducing the Cause of her Beatification: “The pious virgin, Gemma Galgani, if not by habit and profession, undoubtedly by desire and affection is rightly numbered among the religious children of St Paul of the Cross.” And Pius XI in proclaiming her heroic sanctity congratulated “the sons and daughters of St Paul of the Cross on the possession of this true gem of sanctity who would be an additional honor to their Congregation.” Gemma had once described herself as “wandering like a soul that had gone astray”: her long cherished vocation was at last realized and certainly not many vocations have cost such a painful sacrifice. Gemma had offered herself to God as a victim in expiation of the sins of men, and her offering had been accepted. Up to this point she had shared in all the sufferings of Jesus except one—the last and greatest, the agony, sorrow and destitution of His last hours on the Cross. 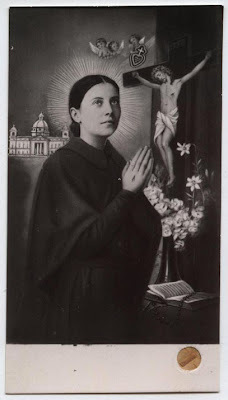 Terribly as she had to this point suffered in soul and body, her suffering had been in secret, and her life was more like Gethsemani than Calvary. After her miraculous cure her health had been perfectly normal, and no one would have suspected that the strong, healthy girl was enduring the tortures of a living martyrdom. But the moment came when her sufferings could no longer be hidden: it was the immolation of the victim. Death was not far off. Some two months later, on Good Friday; she entered with outstretched arms into a prolonged ecstasy, nailed, as she said, with Jesus to the Cross. Those who saw her suffering throughout that day and the following night knew that the end was at hand. On Holy Saturday a priest was called and gave her Extreme Unction, and then Gemma was left to taste the full bitterness of the desolation of Jesus on Calvary. 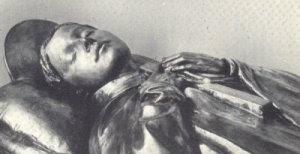 The end came peacefully when with a look of seraphic joy on her face she gave up her pure soul to God an hour after midday on Holy Saturday, April 11th, 1903. Her countenance was so beautiful and peaceful that those present found it difficult to convince themselves that she was actually dead. Gemma Galgani was beatified by Pope Pius XI on May 14th, 1933, and canonized by Pope Pius XII on Ascension Thursday, May 2nd, 1940. Among the vast multitude that filled St Peter’s on the day of her Canonization were thirteen hundred of the citizens of Lucca headed by their archbishop. Many of them had known her, including the numerous members of the Giannini family which had so devotedly befriended her. There too was her youngest sister Angelina sitting by the side of the nun of St. Zita who had taught her as a child and guided her first steps in the path of heroic sanctity. The feast of St Gemma is April 11th (and also May 16th for those in the Passionist Congregation). and as i am not a saint...it was releasing myself from this vow of suffering with humility and knowing i can not bare such torments and can be more of use to others when not in hellish torment...everything began to change...hope came...healing is coming...patience...progress..all i have suffered all my life, judgements, fear, confusion, clarity apart from words and stories...andi hope true love in my heart for others...as well as healing powers greatly icnreased...thealing many...and i thank You. God bless you,,, may you become a saint just like Saint Gemma. A true saint please pray saint gemma that there may be more religious oorders for men right here in san diego california. I ask your powerful intercession before Jesus Christ. Amen. Igv. The relics of many Saints were brought to my parish, and as I went from one to another, I found different feelings with some. 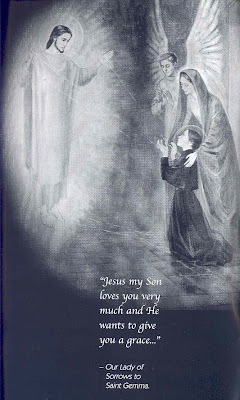 A smell of incense with St. John Vianney, of perfume with St. Claire of Assisi, electric currents through half my body before St. Cecilia, unsteady feet before Sts Paul and Peter, humility with St. Francis, shame and contrition before St. Maria Goretti, sorrow before Our Lady's veil. As I stopped before St. Gemma's relic, I was struck by her photograph. Her intense eyes and reflective expression intimidated me, but I felt no physical signs of her influence upon me then. I went home, and as I slept, I dreamt of many saints and blesseds around me answering the questions I had asked at the exposition. Then, I saw St. Gemma, in her simple clothes, and her intense eyes pierced me and set me to stillness. I remembered her relic instantly and said, "You did not touch me at the church like these others did, and you are here?" She shook her head, and took me by the hand and made me to follow after her. She didn't once look back at me, or speak out loud, yet I felt within me some sense of disapproval, as if she were scolding me for, "not listening when you ought to listen." I know in this dream she charged me with some tasks, and was who should help me with my petition of courage and spiritual fire to defend my faith and offer myself for the will and glory of God as he should see fit. I am saddened that my dream ended and most of the things she told me are shrouded in fog. As i awoke, I felt as if i had held in my hand some precious, important thing she had given me, and my fist was clutched tightly by my side, but it was empty, and I panicked and began searching immediately in the covers, to find it, but nothing appeared. I could not remember what i had lost, and was immediately filled with sadness; like she admonished me, I don't listen when I should. I hope that she grant me once more a visit, so I can do what I must. Could it be she was asking you to become a victim soul? I am the anonymous of February 16, 2013, above. Since I wrote that comment, many things have come to pass which I now believe relate to my dream of Saint Gemma. At the time of the relics exposition, I had recently been diagnosed with an autoimmune disorder that will eventually destroy my liver, and more likely than not, cut my life shorter than I would have otherwise lived. as my liver begins to fail, I will be faced with something called hepatic encephalopathy due to accumulation of toxins that my liver will not be able to eliminate. I will lose my mind long before I die. I was broken hearted, i had just begun medical school, i hoped to serve God by caring for the suffering, and now i wouldn't be able to work as long as i thought i would. I was in spiritual turmoil, having also recently lost my father. I was conflicted about what to pray for, as I felt absurdly unworthy to ask God for a miracle, because who am I to deserve such a thing? As I touched each relic, I asked only for courage and strength to accept the will of God. The night I dreamt of St Gemma, I woke up in terrible distress because I did not remember what she had given me or what she had told me I should do or expect. A little over a month later, my husband allowed himself to be seduced into an affair by the reprobate, married choir director of the parish we belonged to at the time. I struggled with my losses, struggled through my academics, and as the suspicions began to arise, I also had to face my husband's anger against me for daring to question the sudden, excessive amounts of time he spent with that woman at "practice", visiting with her, going out with her, and inserting her into our lives while at the same time resenting my wishes to be with him and have him comfort me through my distress. This was the man who wrote me a heartfelt, loving letter on the day of the expositions, telling me how happy I made him, how I made him a better man and brought him closer to God! How did it go from that to him believing I was horrible, controlling, unloving, disrespectful, in just a matter of weeks?! It could only have been the work of Satan. I have read the sections of Gemma's battles against the devil, how it turned her loved ones against her, discrediting her and slandering her and her intentions. Well, I can see so many of those same tactics in the events that unfolded in early June of 2013, when I finally found proof of the affair and my entire life collapsed under the damage, the hatred, the lies I endured for months from my husband, and the derision and cruelty with which he treated me when I begged him to open his eyes and see that he was in sin and that woman was not the Godsend he proclaimed her to be, because adultery is a sin, and God wouldn't send anyone to manipulate him into it. For the past year, I've suffered a debilitating depression that, combined with PTSD over the events around my discovery, have placed me on the verge of madness and so much despair as to make me beg God for death, to even seek out a way to kill myself on more than one occasion. Despite the fact I have been so extensively damaged by all this, I am treated by my husband's family as if I am the one who has committed a horrible wrong against their brother. I am accused of being cruel and abusive and of faking my depression to "punish" him for cheating. I feel so isolated and lost in the chaos and darkness of my heart that sometimes it is difficult to feel the love of God for me, but I never stop praying. I feel so torn up and desolate, and reading about Gemma's suffering when the devil tried to leave her without the love and support of her friends and family feels almost like a parallel to my own experience. Sadly, in my case, I will not receive their support, love, or respect again. Even though I still cannot remember what Saint Gemma communicated to me in that dream, I have come to believe she came to warn me of what was to happen between my husband and his affair partner. I feel like I failed to act to prevent it. I feel I should have listened carefully and implored God's assistance against such evil and destruction. At the time the choir director started insinuating herself to my husband, he had begun considering the vocation of permanent deacon and had approached someone to begin his discernment. He never got a chance to even meet with his would-be advisor. The very next day was when she emailed him a request for his personal phone number and began the first of several thousand text messages and secret chats between them. We used to pray the liturgy of the hours as a family every day, and when she learned about it, she laughed and mocked him for it... He stopped praying altogether during the affair. I pray for St. Gemma's intercession, so that my husband never again is blinded by the lies of the devil, that he cling only to God, I pray for strength of faith and of love to heal my broken heart and forgive the wrongs and pain I have suffered. I pray for all struggling marriages in the world, for perseverance in the face of their difficulties, that they find again the love that united them before God, and that their eyes are open wide to the tricks of the enemy. Finally, I ask forgiveness for my pride, for allowing despair and torment to push me to the edge of committing suicide, for not trusting that God does not abandon me, even when I am enduring the worst tortures my heart has ever known. Blessed be Jesus and Mary. I suspect the fact that you could not remember what Gemma told you in your dream back in February 2013(and also what she gave to you) was because the warning/information was to strengthen your soul for what was to come, but you had to come to know and experience it on your own, without any foreknowledge of it....in other words, Gemma came to strengthen your spirit for what was soon to come, but not to inform your conscious---anyway, this would be my interpretation and thought on the matter, for whatever it is worth. As far as your husbands infidelity, I just have to say this one thing--you said "I feel that I failed to act to prevent it", well, I believe that it is important for you to know that there was NOTHING you could have said or done to prevent such a thing---when a married man has an affair he is not thinking about his wife or the pain that the revelation of his infidelity will cause her--he is thinking about lust and the excitement and thrill of the chase, although at the same time deep down he very well knows it is sinful and that it is forbidden fruit. From my perspective what happens in such cases is that the temptations from the enemy besailing the "lower" part in the man wins over the "higher" part (the spiritual part with the intellect and reasoning) of the man. As for the deep despair and thoughts of suicide--this is the temptations of the enemy trying to prevail upon your "lower part" and you must not give in to them. Let your "higher" part, you spiritual self--your soul and spirit in union with Jesus and Mary prevail over such thoughts/temptations. I think there is something else that must also be said: While perhaps you very well may have fallen short at times in your duties as a wife (we are all human with weaknesses and faults) NOTHING you could have done or failed to do would justify your husband being unfaithful to you. And another point: You are quite right--there are close similarities and parallels in Gemma's life in respect to what you too are also undergoing at the hands of your family. So in Gemma you have a friend in heaven who understands very well what you are suffering in this regards. 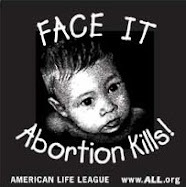 I will post this reply anonymously, because it is simply one soul speaking to another, out of love for Jesus and Mary. 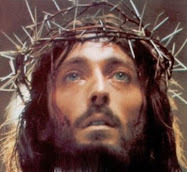 And I pray that Jesus, in His infinite love and mercy, may strengthen, guide and comfort you under the painful crosses that you are bearing. And I pray that St Gemma may be very close to you, to guide and help you in your sufferings. I pray this in Jesus holy name, Amen. St. Gemma, I love you! Praised be Jesus, Mary and Joseph! One of the elements of her story (as well as Padre Pio's story) that has greatly 'offended' me about their struggle to honor God, was the way the Church Leaders were suspicious of their relationship with Jesus. I experienced similar 'judgment' & harsh treatment from Priests throughout my childhood; and consciously chose to leave the Church at age 21. It took more than 30 years for me to return; and it was God Himself (through a 'vision' and 3 other people -- a crippled man and 2 priests) who finally brought me back at age 51. Oh, St. Gemma, please pray for me -- and those like me throughout the world (especially my sons) -- to come back to Jesus & His Sacred Heart and to learn to submit to 'Obedience'! That word has been 'anathema' to me. How can I be 'humble' if I am not 'obedient' to 'authority'? This is such a hard lesson ... especially at my age. St. Gemma, lease pray for all sinners who have 'hardened' their hearts towards the Church. Pray that we all learn to ACCEPT Jesus' Sacrifice on The Cross as the true 'Gift' that it was! Pray that each one who finally receives His Gift will open it and delve into the depths of His Saving Grace! Amen! Thank you so much for your blog about Saint Gemma. I only found out about her today and hence wanting to know more about her came here. While reading some of the comments here I am quite perplexed by how people are telling their life stories of how important they think they are, from tales of woe, to the interpretation of dreams. When reading about the lives of saints, please note that all of them have worked greatly to achieve a life of Holy sanctity, through the graces bestowed upon them of obedience, humility and acceptance to the Will of God. They forget about the self and only wish to please God in all things while carrying their crosses without complaint but with perseverance and humility, they never want to stand out in the crowd. They never complain about illness or suffering and always accept these trials and offer them up for the greater glory of God. The way the saints lived their lives is most important,they received the sacraments often, prayed often during each day,through constant prayer they received the graces to lower themselves before God and accepted every cross with a pure unconditional love. They allowed God to use their will and to mold them to what was pleasing to Him and Him alone. For someone out of the blue, to ask to be a victim soul without having reaching a certain degree of holiness is sheer folly and only for their own greater good, God does not come into this request. If God was involved you would never speak of it because of the grace of humility. Saints do not complain they simply accept and do God's Will. Hi who is the Author of this website and what is the date of publication?